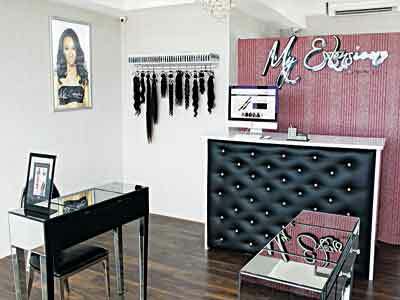 My Extensionz Hair studio in Lagos. MY Extensionz, a popular U.S hair brand has finally made its way to Nigerian fashion industry, with the official opening of an exclusive store in Lekki, Lagos. Located in the popular Lekki Centro Mall, the aim, according to promoters, is to provide easy access to 100% fine virgin hair extensions. The store gives customers the opportunity to explore its wide range of virgin hair extensions along with qualified virgin hair specialists to guide the way. The brand believes that hair is the best accessory of every woman, and therefore, customers are guaranteed authentic hair products, exceptional quality and an ultimate shopping experience. Apart from their accessories such as the magic Brushes, one of the top selling products at My Extensionz is the Silk Based Closures, which is difficult to find in Nigeria. Established in 2012 by the sisters, who were driven by the lack of affordable quality extensions in the market, the brand opened two retail locations in Chicago and a thriving online boutique the following year. Since inception, the brand, which has graced international media outlets such as BET, VHI Essence, People Magazine, Vibe and other local media, specialises in tailored wigs and hair extensions, including luxury clip-in hair extensions, silk/lace top closures and styling tools. All these products can be found in its store and online. My Extensionz has placed itself at the top tier of the market and is currently regarded as one of the go-to companies for high quality virgin hair extensions.